Bring your mum along to our Tea and Tipple Time for an afternoon of cakes, fizz and stunning jewellery! With special offers on the day, plus the chance to view our latest new jewellery collections for Spring, this will be a lovely way to treat your mum for Mother's Day! We're also running a raffle to win Afternoon Tea at the delightful Arden Hotel in Stratford-on-Avon, plus a £50 fabulous voucher! Each guest will receive a FREE RAFFLE TICKET on arrival, and subsequent tickets will be sold to raise money for Breast Cancer Now. 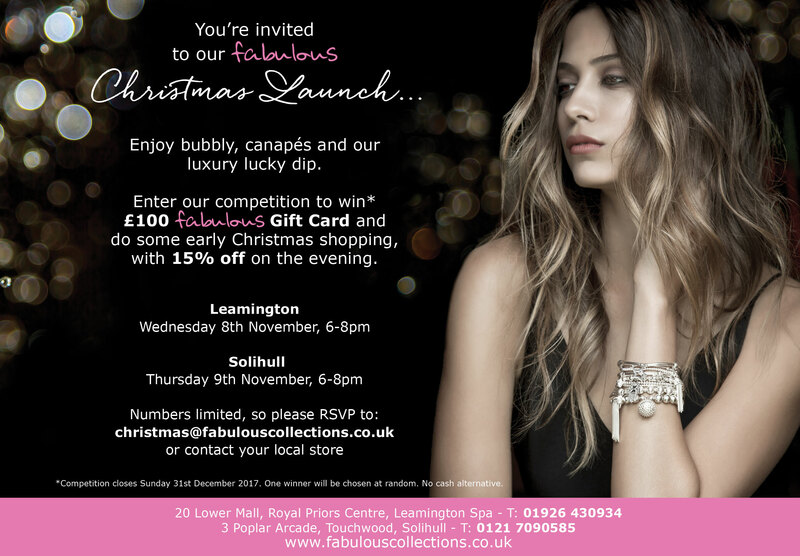 Places are limited so email leamington@fabulouscollections.co.uk to reserve your free tickets now! Join us for an evening of bubbly, canapés and beautiful jewellery. We’ll be showcasing our newest collections for Autumn/Winter with stunning pieces from Thomas Sabo, Alex and Ani, ChloBo, Daisy, Nikki Lissoni and many more. Also, be one of the first to see the new watches from Sara Miller London. There’ll be exclusive offers on the night, perfect if you’re making an early start to your Christmas shopping or you just fancy treating yourself. 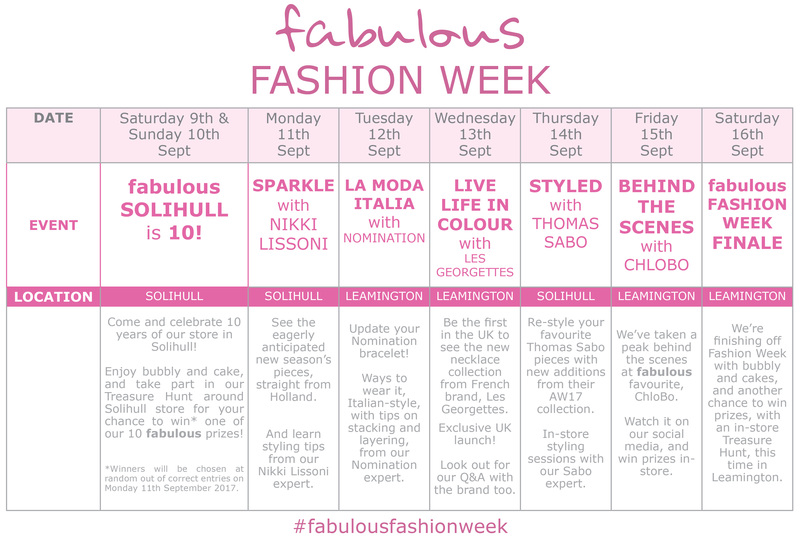 Book your FREE place now by emailing leamington@fabulouscollections.co.uk or calling us on 01926 430 934. Our biggest ever Summer SALE has launched in our LeamingtonSpa branch. Save up to 70% on huge brands, such as Thomas Sabo, Nomination, ChloBo, Nikki Lissoni, Daisy etc. Care International would like us to walk 10k steps a day for a week from 16th to 22nd April. Doing this, we can make a real difference to the lives of women and girls around the world. Every day thousands of women and girls, all over the world, have no choice but to walk many miles to fetch water for their families. Their daily routine deprives them of the chance to have an education or a job, and traps them in a cycle of poverty. The money we raise can help build wells and water pumps closer to rural communities so that women and girls don’t have to spend their days walking for water, and can plan for a better future. Projects run by Care International have helped bring water to communities all around the world. In Ethiopia, CARE’s Water, Sanitation and Hygiene Project built or rehabilitated 1,479 water points in rural communities, providing safe and adequate water access for 302,192 people. 80% of households there now travel less than half an hour to get water. The money we raise can really help change the lives of women around the world. fabulous is one of more than 1600 registered #givingtuesday partners across the UK. The campaign, which began in America, is an antidote to the mass consumerism of Black Friday, and aims to get people thinking of others in the run up to Christmas, be it through donating to charity, volunteering or simply helping a friend, neighbour or family member. This year, in-store, we are participating with a ‘Reverse Advent Calendar’ to support local Food Banks. Customers and staff are encouraged to fill an empty box, with a gift a day of food or toiletries, throughout December, to enable full boxes to be delivered to local Food Banks just before Christmas. “We love the Reverse Advent Calendar concept, and believe our customers will too,” explains Jo. #givingtuesday now runs in over 70 countries around the world. For the past two years, it has broken the Guinness World Record for the most amount of money donated online to charity in 24 hours: a massive £35 million globally, with the UK accounting for the second largest amount of donations. An estimated 4.5 million people in Britain also did something to support a good cause on the day. This year, #givingtuesday is on Tuesday 28th November. We’re hosting our own Fashion Week to celebrate the fabulous jewellery from our international designers, including Nikki Lissoni, Nomination, Les Georgettes, Thomas Sabo and Chlobo. 9th & 10th Sept - Fabulous Solihull is 10! Come and celebrate 10 years of our store in Solihull! Enjoy bubbly and cake, and take part in our Treasure Hunt around Solihull store for your chance to win* one of our 10 fabulous prizes! Styling sessions by Alex and Ani at 11am and 3pm. Drop in! *Winners will be chosen at random out of correct entries on Monday 11th September 2017. See the eagerly anticipated new season’s pieces, straight from Holland. And learn styling tips from our Nikki Lissoni expert. Update your Nomination bracelet! Ways to wear it, Italian-style, with tips on stacking and layering, from our Nomination expert. Be the first in the UK to see the new necklace collection from French brand Les Georgettes. Exclusive UK launch! Look out for our Q&A with the brand too. Re-style your favourite Thomas Sabo pieces with new additions from their AW17 collection. In-store styling sessions with our Sabo expert. We’ve taken a peak behind the scenes at fabulous favourite, ChloBo. Watch it on our social media, and win prizes in-store. 16th Sept - Leamington Stores - Fabulous Fashion Week Finale! We’re finishing off Fashion Week with bubbly and cakes, and another chance to win prizes, with an in-store treasure hunt, this time in Leamington. Take part in the Fabulous Autumn Winter Styling Challenge for your chance to win £100* to spend at fabulous!